Daylilies are in full, blooming glory along our Pennsylvania roadsides now. 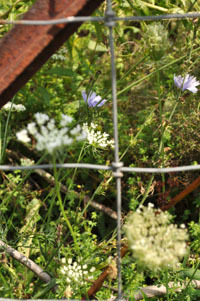 I always assumed, because of their location, that these were the native variety. I was wrong (not for the first time, mind you). According to daylilies.org (hey, where else was I going to look for answers?) 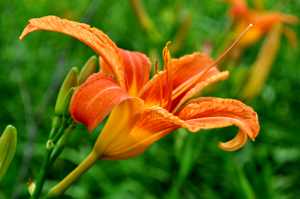 daylilies that dot roadsides “escaped” at some point–that is, they are a hybridized version of the wild/native and the domesticated varieties which have been around since the 30s. Underground bulbs of the wild lily reproduced vegetatively or were dispersed by hungry rodents. Native Americans also ate the bulbs, boiled; Cree referred to the species as “mouse-root” because of its association with voles. (Mind you, the lily family contains species not safe to consume). 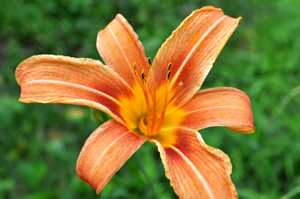 Hemerocallis is the genus name meaning “beauty” and “day”, hence the name “daylily” (each flower lasts only one day). However, I’ve learned through my online research that each daylily clump can produce 200-400 flowers in a season. Multiply that by the hundreds of clumps in any roadside stand of daylilies and you’re in for a spectacular show lasting throughout the better part of the summer! Beautiful Bloodroot is a woodlands flower that blooms, for us in Pennsylvania, during the first or second week in April. Large, lovely palm-sized leaves envelop a single white flower—the bloom lasting a mere week or so. 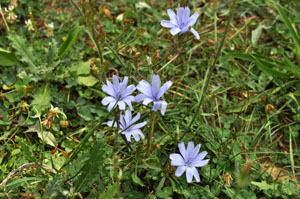 Once the petals have fallen, the lush, green foliage heartily remains through the warm months. Before I go any further, let me mention: Bloodroot is TOXIC. 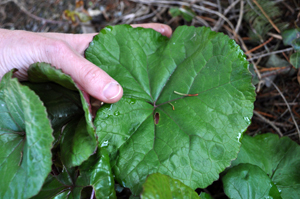 Do not consume any part of the bloodroot plant. Certainly, a name like “Bloodroot” deserves a little research, don’t you think? It’s not surprising the name refers to its orange-red root. Stems will “bleed” this color when broken and Native Americans used the juice for everything from face and body paint (which lasted for days) to dye. 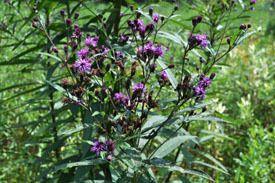 Root teas were fashioned to combat asthma, laryngitis, coughs, etc. 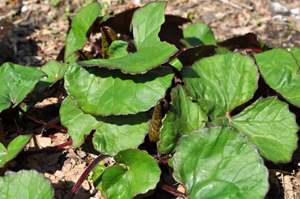 Topically, Bloodroot poultices were used to treat eczema, warts, and skin cancer—its “active ingredient” is sanguinarine. 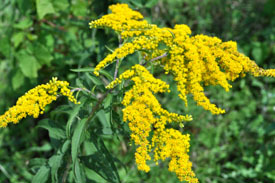 There is so much information online about this unique, singular, almost “reclusive” woodlands plant! 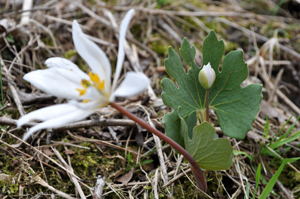 I hope you are lucky enough to be able to observe it in the wild (it’s protected in many states so please abide by this when observing Bloodroot in its natural habitat). Our host, Tracy Toth, completes our tour of a riparian buffer while demonstrating how native plant species can support a healthy ecosystem. The third summer we were here I noticed cars slowing and occasionally stopping on the road nearer the pasture. 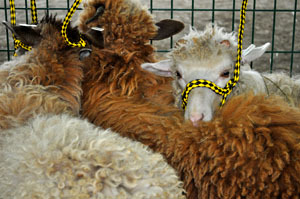 I thought, for the longest time, they were looking at our animals. I hope this webisode, in particular, serves as a simple lesson in conservation: that something so easy as letting native species propagate a waterway buffer can naturally accomplish so many vital “tasks” that are necessary for a healthy ecosystem. That, and you get to enjoy one heck of a butterfly show! 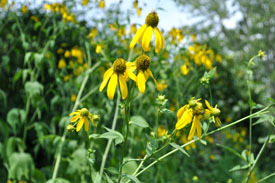 Our host, Tracy Toth, demonstrates how providing an opportunity for native plant species to propagate a waterway buffer can naturally accomplish so many vital “tasks” that are necessary for a healthy ecosystem.